Kathleen R. (Remick) Monsini, 74, of Brockton, passed away Sunday, March 31, 2019 at the Beth Israel Deaconess Hospital. She was the former wife of Robert A. Monsini, Sr.
Born August 9, 1944 in Plymouth, she was the daughter of the late Stanley Remick and Gina L. (Pedrini) Remick. Raised in Plymouth, she graduated from Plymouth High School. Kathleen worked for John Hancock and also for Wallen Electronics. She enjoyed going to the casino and traveling with her cousins and nieces, she most especially enjoyed spending time with her grandchildren. She is survived by her sons, Robert A. Monsini, Jr., Michael S. Monsini and Richard J. Monsini; her grandchildren, Jacob, Julia and Angelo Monsini; her sister, Judith Tassinari and her husband Charlie; she is also survived by many cousins, nieces and nephews. She was the sister of the late Keith Remick. 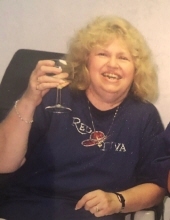 Funeral from the Russell & Pica Funeral Home, 441 South Main St., (RT28) West Bridgewater on Thursday, April 4th at 9:00AM thence to St. Ann’s Church, 103 North Main St., West Bridgewater where a funeral mass will be celebrated for the repose of her soul at 10:00AM. Interment will follow in Pine Hill Cemetery, West Bridgewater. Calling hours in the Funeral Home on Wednesday from 4:00-8:00PM. In lieu of flowers, donations may be made to the Leukemia & Lymphoma Society, 70 Walnut St., Wellesley, MA 02481. "Email Address" would like to share the life celebration of Kathleen R. Monsini. Click on the "link" to go to share a favorite memory or leave a condolence message for the family.